Prominent & Leading Manufacturer from Chennai, we offer titanium centrifugal pumps, titanium impellers and titanium pump spares. We are manufacturers and suppliers of Titanium Centrifugal Pumps (Back Pull out design) for various process industries for severe corrosion environments. 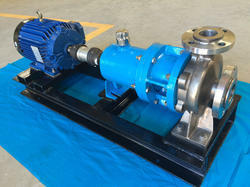 Our Titanium Pumps are fabricated in construction and manufactured in accordance with ASME B73.1. find application inOur Titanium pumps are popularly used in Caustic -Chlroine and Pulp&Paper Industries. Modular construction, high interchangeability, fast delivery. Versatile shaft sealing arrangement, Gland packing as a standard arrangement and option to use mechanical seal. Process type design results in minimum downtime. Back pull - out design enabling easier removal for inspection and maintenance. Closed impeller ensures high efficiency for a long period operation. Good continuous process with high productivity. 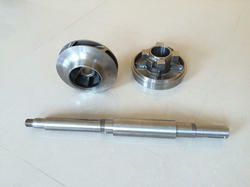 Bigger shaft and bearing size enabling sturdy design. 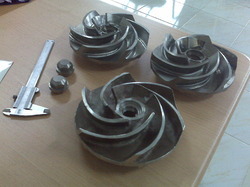 Titanium impellers for fabricated titanium centrifugal pumps, Titanium shaft sleeves, impeller lock nuts are supplied according to production sample or as per customer's drawing. 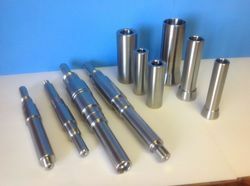 Titanium Shaft Sleeves for Titanium Centrifugal Pumps that are used in Chemical Process Industries. Titanium Back Plate, Titanium Impeller and Titanium Shaft are part of Centrifugal Brine pumps that are made of Titanium Construction. Generally commercial pure titanium Gr.2 are used for manufacturing these parts.